OSWEGO, NY – Thanks to the efforts of Oswego County Opportunities and the New York State WIC Program, expectant mothers and mothers of young children throughout Oswego County are able to receive the proper nutrition and health education they need to live healthy lifestyles and make the right food choices for their families. Dottie Wehnau, a facilitator with the Just Say Yes to Fruits and Vegetables program recently visited the offices of OCO’s WIC program to share a presentation with WIC participants. Administered locally through OCO, the New York State WIC program provides women, infants and children with supplemental food and nutrition education. A program of the Supplemental Nutrition Assistance Program, Just Say Yes to Fruits and Vegetables focuses on the importance of including fruits and vegetables in your diet as well as how to properly wash and prepare fruits and vegetables for your table. From left are Sharon DeLand of WIC, Stacie France, IBCLC, Support Services Manager for WIC and Wehnau. Administered locally through OCO, the New York State WIC program provides women, infants and children with supplemental food and nutrition education. The program serves pre-natal, breast-feeding, post-partum women (up to six months) and infants and children up to the age of five. In recognition of National Nutrition Month the WIC program has focused its efforts on nutritional education, increasing physical activity, and maintaining healthy lifestyles. 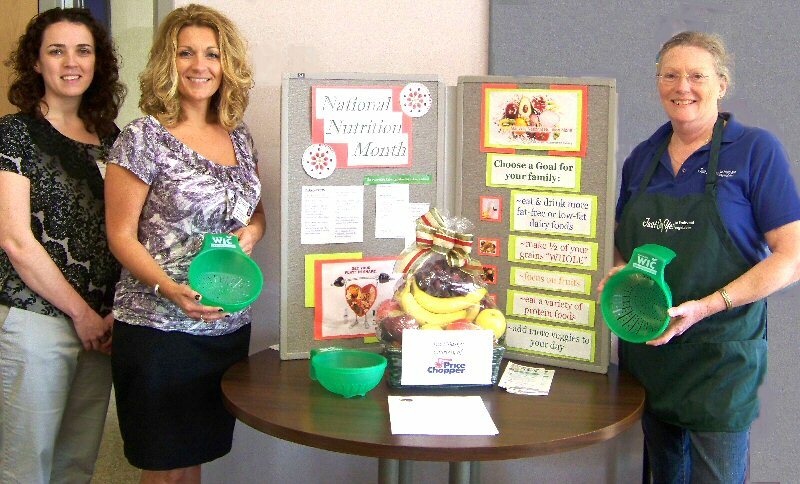 During the month of March WIC has been celebrating National Nutrition Month by hosting nutritional presentations, stressing the importance of food safety and preparation, hosting several participant centered counseling sessions, and offering participants the opportunity to win a fruit basket courtesy of Price Chopper. According to Stacie France, IBCLC, Support Services Manager for WIC, one of the most popular presentations was Just Say Yes to Fruits and Vegetables. Facilitated by Dottie Wehnau, Just Say Yes to Fruits and Vegetables is an educational program of the Supplemental Nutrition Assistance Program. While the program is predominately held at food pantries and shelters throughout New York State, France thought it important to bring the presentation to Oswego so that WIC clients could benefit from it. “Just Say Yes is an excellent presentation that helps amplify many of the healthy nutritional habits that we discuss with our clients. Dottie’s presentation touched on properly washing and preparing fruits and vegetables, as well as the possible consequences of not preparing food properly. She shared a number of healthy recipes and the WIC Program distributed complimentary colanders that our participants can use for washing their fruits and vegetables,” said France. The WIC program’s participant centered counseling focuses on helping mothers develop healthy lifestyles for themselves and their children. OCO’s WIC program staff is comprised of dedicated health professionals who receive ongoing training to ensure that participants get the most out of the health benefits the WIC program has to offer. “Every day, at every site, we offer a nutrition education group where moms or caregivers engage in discussion on topics such as breast feeding, potty training, recipes, or any other concerns they wish to share their ideas on. It is an excellent learning process for our consumers,” said France. Currently OCO’s WIC program serves more than 3,000 individuals in Oswego County providing mothers and their children age 5 and under with benefits that allow them to purchase healthy foods from local grocery stores. WIC promotes healthy foods such as milk, whole grain breads, eggs, cereal, peanut butter, brown rice, fruits and vegetables. Additionally during the summer months families receive benefits that allow them to purchase fruits and vegetables at their local farmers’ markets. “WIC benefits help to improve overall heath and encourages positive behavior changes by focusing on healthy eating and physical activity,” said France. According to France, OCO’s WIC program is easy to sign-up for and starts with a simple phone call. “Thanks to our automated system the application process begins over the phone. Once eligibility is screened, applicants are scheduled for a face to face appointment with a staff member to receive certification and official enrollment in the WIC program,” said France. For the convenience of the applicants OCO maintains 13 sites throughout Oswego County where WIC staff members can meet with the applicants and finalize the enrollment process. The Oswego site is open one Saturday a month and offer early morning and evening appointments. To make an appointment at a location near you contact WIC’s main office at 315-343-1311 or 1-888-730-3803.